The dress consists of a bodice yoke that is attached to the main bodice by a lapped and gathered seam on both the front and back. The back bodice is slightly bloused at the waist. 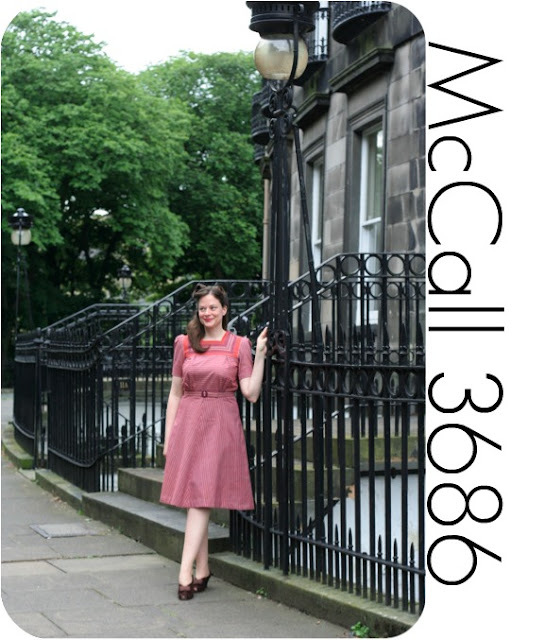 The skirt is a simple two piece a-line that is also attached to the bodice by a lapped seam. The sleeves have a gathered sleeve cap. I also made a matching belt for the dress. I did run into a slight panic moment with the dress. Since I used the selvedge of the fabric to make the bodice yoke piece, I didn't need to finish the neckline. I wasn't even thinking about the seam allowance and whether I would be able to fit the dress over my head!! eeps. Went to try it on and I definitely couldn't get it on. So I ended up sewing a few snaps alongside one of the shoulder seams. hahaha! I call it a 'design feature'! I am very, very happy with the dress and imagine I will get a lot of wear out of it! 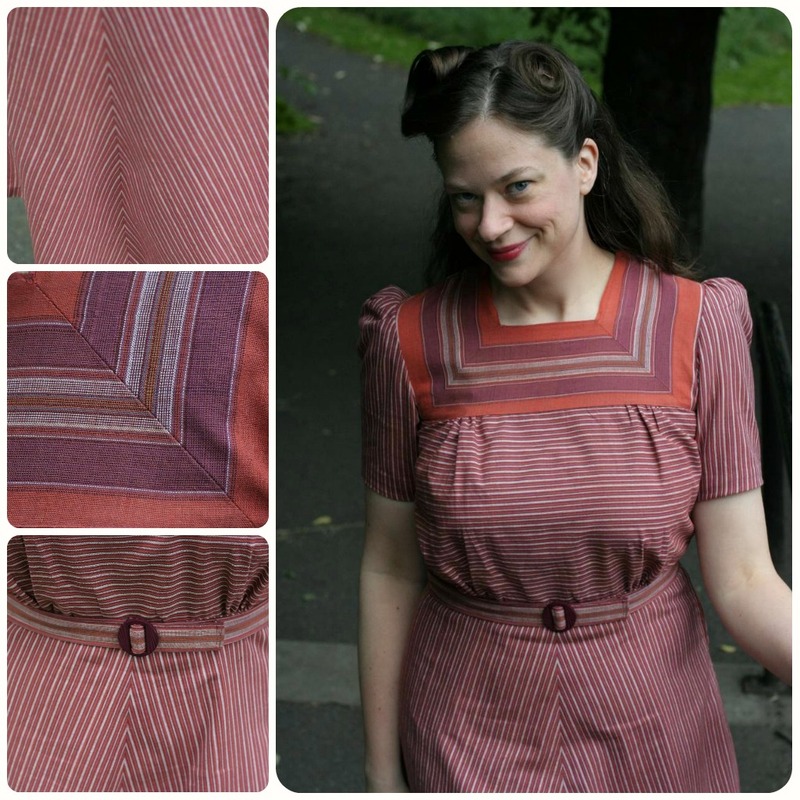 I love how subtle the pinstripes are and the beautiful colours of the fabric! YAY! I can't wait to share this fabric with you all...stay tuned for more Weaving Destination fabrics!! This dress makes a beautiful start of fall transition... The pattern really showcase the beautiful fabric ... Cannot wait to see how far on your sewing challenge you will be by December. Fab dress .. The pattern and fabric really showcase each other. I've loads to do on my dress yet! This is fantastic, really! The matched stripes look so perfect, and the colours are really beautiful! You did an amazing job with this dress, my compliments. The matching is just so precise & lovely. The dress & fabric is beautiful. 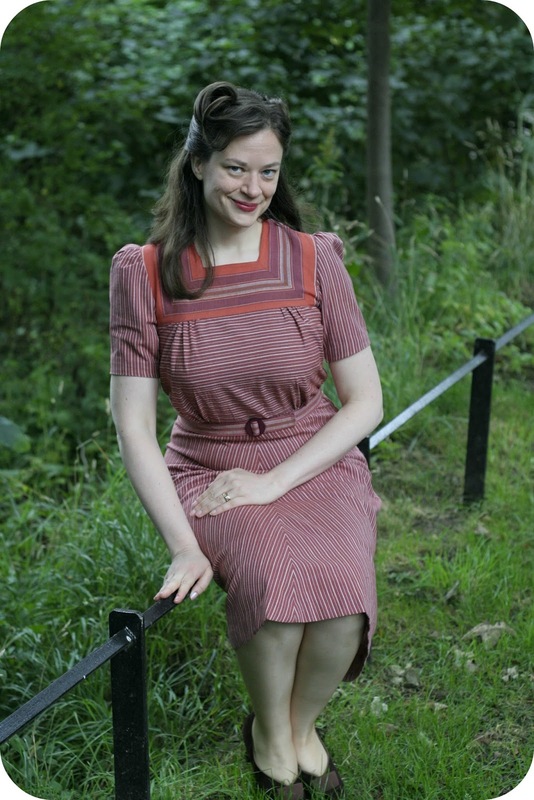 You look so stunning, the dress is a real inspiration to try and use stripes in different ways. The fabric is so beautiful, looking forward to seeing more Weaving Destination Fabric and hopefully being able to buy some! Debi, that is so, so pretty and beautifully made. Absolutely love it! This dress is so gorgeous Debi!!! loving that neckline. This is really pretty. The fabric is lovely (I will eagerly await seeing the Etsy store) and the use of the edge for the neckline is perfect. I look forward to seeing your next 1940 make. Wow, what a great use for that fabric. You look so good in the 40s! 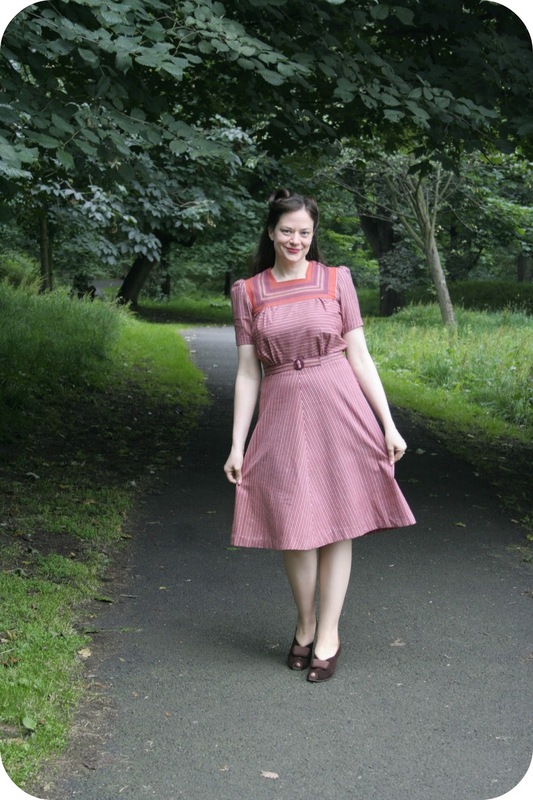 What a fabulous dress - and a great colour for Autumn! I love the fabric, and the yoke, and the belt - the whole outfit really! It looks wonderful! Such a beautiful fabric that can transition to every season too. And you always have the best smile! Love it, Debi. Great palette for you! Oh my! What a beautiful and well constructed dress! You always do such astounding work! The fabric is a perfect pairing for this dress and a great color for fall! Looking forward to seeing more of your fabrics! I have been following your blog and sewing adventures for a while now and this dress and project have inspired me to comment. I really love this dress! Everything about it is perfect, the style, the fabric and the construction. I really admire your ability to make these vintage patterns fit you so well. I am really put off by the challenge of fitting a pattern that was drafted for a very different body than mine. And the fabric is fabulous! I have already marked the shop on Etsy as a favorite and will check back often anxious to see the wonderful fabrics and scarves. Congratulations on the award you and your partner received. Do you have any information on other projects funded by this organization? I love the fabric, and the yoke detail is PERFECT!! I have been lurking for a very long time, and I have enjoyed seeing your parade of creations from vintage patterns, but this one utterly takes the cake! Love, love, LOVE it. Absolutely perfect combination of pattern and fabric. And I LOVE what you are doing with your social enterprise, Weaving Destinations. Love the bold stripes on the yoke! i LOVE it! The colours are sumptuous! Oooh this is really lovely. Love the colors and the yoke! Can't wait to see the new Weaving Destination fabrics. I think what you and Javita are doing is fabulous. I think this is my favourite thing you've made! The fabric works perfectly, and the whole thing looks fantastic. I can't wait to see more Weaving Destination fabrics. Gorgeous! Pure genius for the neckline snaps! Debi, you look so fantastic in this dress! WOW, this is AMAZING! 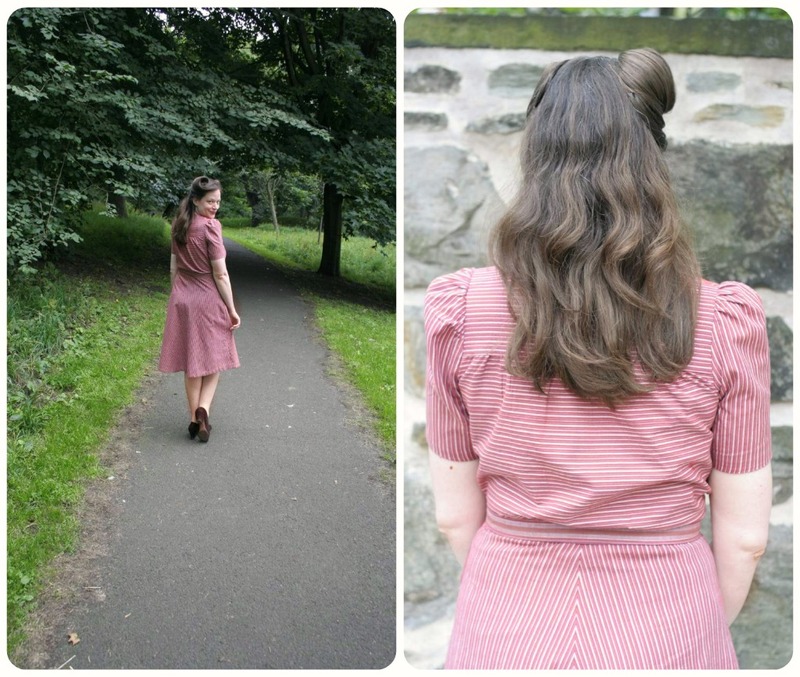 This might be my favorite of your 1940 dresses! Lovely! Awwww! Thanks Ginger--I really love this one too! Thanks so much Rachel! We've just listed our Weaving Destination fabrics on Etsy! Thanks so much for the lovely comment!! I'm having a lot of fun with the 1940 patterns...and being able to help out with Weaving Destination has been such a joy! Thanks so much for all your support! This is so pretty! I love the squared off neckline/chest area. Really pretty 40's make! The dress is wonderful. You did a great job matching the stripes! Love the neckline. Congrats on finishing your Fall for Cotton project! 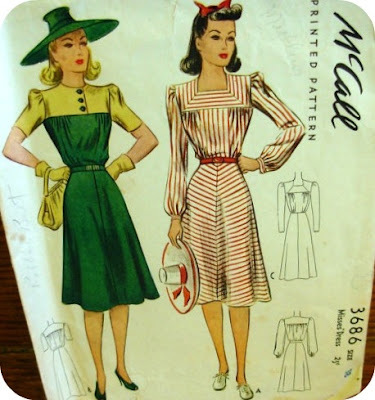 I was wondering if I might ask you a question since I know that you are so familar with this early 40s patterns. I am working on a pattern from 1940 with the puffy sleeve effect and it uses a sleeve stiffening. What base do you use for your sleeve stiffening material? Thank you!!! Weaving Destination Fabrics Now Available!